Blue is often associated with depth and stability, which combine to create a solid foundation for a long and happy marriage. If you are looking for something out of the ordinary in terms of a wedding band, look no further than our blue stainless-steel wedding band. This ring will certainly be a conversation starter for years to come. 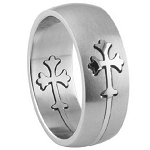 Modern couples are choosing alternative metals in lieu of gold, silver, or platinum. Stainless steel is one of the most popular, by far, because it is extraordinarily resistant to corrosion, tarnishing, and scratching. Steel is also hypoallergenic and much less likely to aggravate sensitive skin. Our men’s blue stainless-steel wedding band will serve as a romantic remembrance of your special day. If you or your groom has blue eyes, our blue stainless-steel wedding band will look picture-perfect on the big day. Stainless steel has long been used to produce gentlemen’s accessories, so it’s no surprise that grooms are choosing this alternative metal more than ever before. 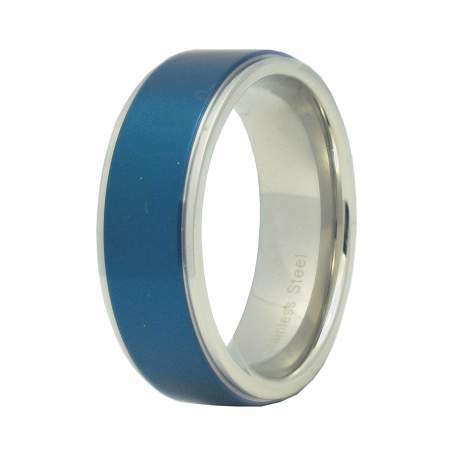 Each men’s blue stainless-steel wedding band features an 8mm band with a brushed finish and polished edges. Traditional bands such as these feature a straight interior and do not have a domed interior that comfort fit bands have. If you are unsure whether a traditional fit is right for you, we recommend that you have your ring finger sized by a professional jeweler prior to making your final decision. Please contact us with any questions or concerns, and a JustMensRings.com representative will gladly help. This is a very nice ring, smooth and fits great. I like the blue.